At Graphic Enterprises, we care about the health and welfare of our employees, as well as our community, and we seek ways in which we can give back. For the past two years we have been very fortunate to have the opportunity to be a sponsor of the Annual AultCare Wish-a-Thon benefiting a great local organization, Wishes Can Happen. Wishes Can Happen grants wishes for Ohio children and young adults with serious and life-limiting medical conditions. It is an all-volunteer organization, supported entirely on donations, and 100 percent of the proceeds go straight to the kids and their families! They have been able to grant more than 1,000 wishes in the past 30 years. I was able to take to the airwaves from the site of the event on both News-Talk 1480 WHBC and Mix 94.1 to help promote this wonderful organization and encourage others to lend their support. One of the amazing things about this organization is that you can see the impact of your donation almost immediately. Just before it was my time to speak on the radio, a little girl and her brothers spoke about their Wishes Can Happen experience. Her wish was to meet the Disney Princesses. Wishes Can Happen sent a limo to their home, took them to the airport, flew them to Orlando and provided a week-long stay at a Disney resort. The little girl was most excited about getting a “tattoo,” and the boys were excited about getting to eat ice cream for breakfast. A child with a terminal illness impacts the entire family in so many ways. Through our corporate support, and that of others, we were able to help this family make some really nice memories! In addition to giving to Wishes Can Happen as an event sponsor, Graphic Enterprises’ amazing employees gave $245 in spare change. We are so proud and thank them for their generosity! We look forward to participating in this fantastic event next year and making more wishes come true for children and young adults in Ohio. On May 8 at Legends Sports Pub & Grille in Green when Marketing Director Denise Dennewitz and I tried our hand at guest bartending for a worthy cause. This is one battle where there were only winners! Our efforts helped raise funds for the Akron Rotary Camp for Children with Special Needs. In cooperation with the Akron Area YMCA, the camp offers children and adults with disabilities the opportunity to experience all the friendship, fun and excitement of camp. Denise and I put our bartending skills to the test from 6 to 8 p.m., with all of the tips from our friendly competition going to the children’s camp. No matter who won the match-up, the real winners will be the children who will get to go to camp as a result. The Akron Rotary Camp is American Camp Association (ACA) accredited and provides a nurturing and enriching atmosphere where campers develop relationships, skills and memories that will last a lifetime. Rotary President Bill Manby Jr. says the facility now serves nearly 2,000 children through summer camping experiences, and also offers year-round respite programs and family advocacy programs. No one is turned away for the inability to pay. He expressed his gratitude for the willingness of local businesses to contribute to a cause that makes a positive impact on so many people. Giving back to the community has always been a part of our mission here at Graphic Enterprises, and we are grateful for this opportunity to help support such a worthy cause. One of our core values at Graphic Enterprises is operating as a faith-based business. Throughout the year, and especially at the Christmas season, we want to share the blessings we have received and to give back to the community where we live, work and raise our families. 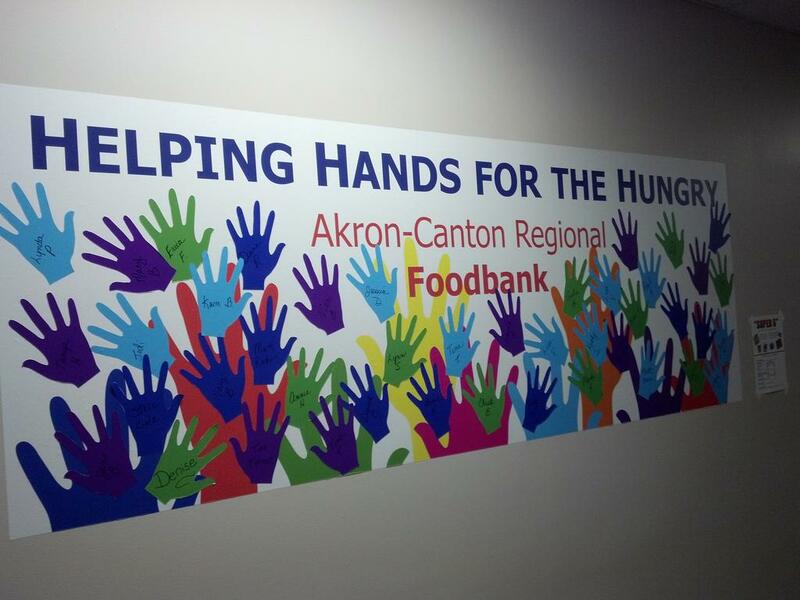 One organization that does so much for our area is the Akron-Canton Regional Foodbank. Supporting Carroll, Holmes, Medina, Portage, Stark, Summit, Tuscarawas and Wayne Counties, the foodbank is a distribution center the purchases large quantities of food at reduced prices, sorts it and then distributes it to agencies in its eight-county service area. About 180,000 people receive nutritious meals each year because of the foodbank’s network. Our program is called Helping Hands for the Hungry, and each time an employee donates, they get to put a “hand” on the wall display in our office. In 2011 we collected approximately 300 pounds of food to give to the foodbank. This year our goal was 500 pounds, but we are well on our way to 1,000 pounds already! The generosity of the team is wonderful. In addition, we’re participating in Coats for Christmas, an initiative of A Community Christmas, a local, non-profit, all-volunteer organization that strives to coordinate Christmas giving efforts in Stark County. Our North Canton location is one of 81 places that people can donate new and gently used coats in all sizes for infants, children and adults. All coats stay in Stark County and are given away at no charge at Goodwill stores and at Calvary Mission. Last year A Community Christmas distributed more than 2,200 coats. We are privileged to support two worthy causes. I hope that what we and many others are doing throughout the area will make an important difference for neighbors in need. Merry Christmas! If you missed the opportunity to hear our recent broadcast on News-Talk 1480 WHBC, then let me tell you about a wonderful local organization we have been making radio waves about. Wishes Can Happen grants wishes for Ohio children and young adults with serious and life-limiting medical conditions. It is an all-volunteer organization, so 100 percent of the proceeds go straight to the kids and their families! Our generous employees donated $500 to Wishes Can Happen, and Graphic Enterprises matched it for a total of $1,000. In addition, we gave two gift certificates for the Spa at Atrium to Nathan Williamson, who we were blessed to have met as part of our broadcast. Nathan’s body keeps producing tumors. Early last year, he had two tumors removed from his abdomen; a few months later, tumors appeared on his brain and in other parts of his body. Part of his wish was to get a massage. Since we had the gift certificates, I called Atrium to make an appointment for him and his girlfriend to get massages. It was a delight to see his face light up! Massages help relieve the pain he experiences every day so being able to help in one small way was a gift to us as well. I want to send a special thank you to Lynda Pwarck for the gift cards. Perfect timing! And many thanks to Bethany, Noelle and Karen for the great pictures you see above and for their support during our radio debut. Finally, a special thanks to all Graphic Enterprises employees who donated! What a great cause!